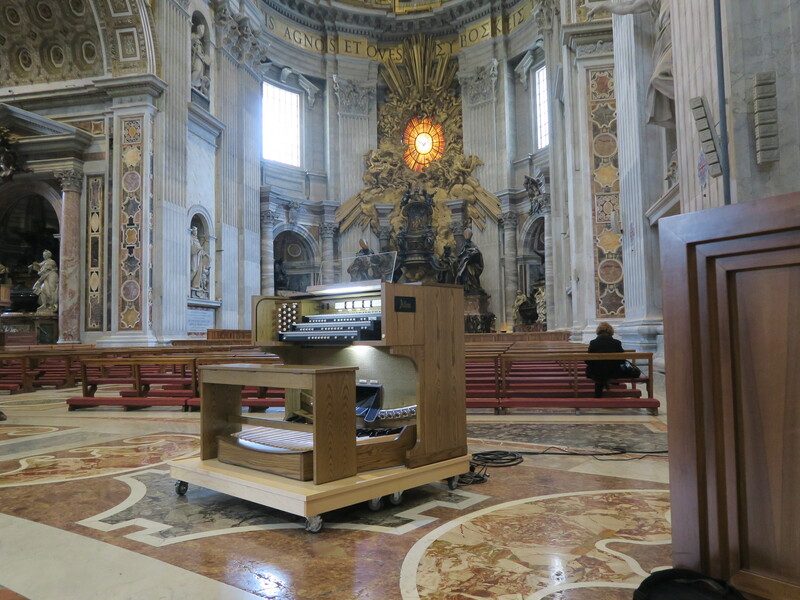 The Allen digital organ installed in St. Peter’s at The Vatican received worldwide press coverage. The article below was published in The Tablet, the International Catholic Newsweekly. It is in response to a petition circulated by the Association of Italian Organists protesting the installation of a digital organ in St. Peter’s. It is disappointing that some from the pipe organ industry impugn the integrity of customers and organists worldwide that have purchased and use digital organs. Organs should be judged on their musicality, longevity, economic realities, and just as important, the needs of customers. Organ builders with a different set of priorities seem to have lost sight of who they serve. I am a second-generation organ builder. Like my father, my entire adult life has been dedicated to building quality organs, most of which are destined for religious institutions. The acceptance and longevity of tens of thousands of installations worldwide attest to Allen Organ Company’s heritage and reputation. Even before electricity, pipe organs were technological marvels. With advanced mechanics, pipe organs, along with town clocks, were the most technologically sophisticated devices in many European cities. With the advent of electricity, their control circuitry became more sophisticated, resulting in increased musical flexibility for the King of Instruments. In the 1930s, radio and vacuum tube technologies entered the world of organ building. In 1937 my father, Jerome Markowitz, received a patent for the world’s first stable audio oscillator. This invention led to organ sounds being generated electronically. This not only started a revolution in the organ world, but also created a schism between organ builders whose sounds were created by windblown pipes and those that produced sounds electronically. Since the introduction of electronic organs over 70 years ago, the pipe organ industry has criticized the use of this new technology. While early electronic organs were capable musical instruments, they could not accurately produce pipe sounds. Advanced digital technology overcame this deficiency, a conclusion supported by many prestigious Allen installations, including combination organs where Allen digital voices are played and compared side-by-side with pipe voices. The pipe organ industry’s anxiety relating to digital organs was brought to the forefront recently after one of our Allen organs was installed in St Peter’s Basilica at the Vatican, the largest church in the world. This organ was heard by the thousands that attended the 2017 Christmas Eve Mass, as well as tens of millions in worldwide telecasts. The response has been overwhelmingly positive. This installation and its flexible audio system allows an organ to be more widely used during the Mass, a reality that should be celebrated by all who love the organ and its music. The pipe organ industries’ contradictory reaction – which can be read here in an online petition to Cardinal Sarah – is similar to what it was seven decades ago, in essence; If it doesn’t have pipes, it is not an organ. The petition, which purports to have received 10,000 signatures, describes the Vatican’s digital organ as an “electrophone”, “surrogate” and “organ substitute”. Put into context, this number needs to be compared with the tens of thousands who attended Christmas Eve Mass in the Basilica and at St Peter’s Square, as well as the tens of millions that watched the Mass during telecasts. These people, along with the musicians at the Vatican, are the ultimate judges of St Peter’s Allen organ. The petition not only impugns an organ, but those that have already determined that a digital organ is a viable musical instrument worthy of supporting their music ministries in thousands of churches worldwide. In 2017, during a tour of the United States, the Sistine Chapel Choir rented an Allen organ for a concert in Detroit, Michigan. They were impressed with its tonality and contacted Allen Organ Company regarding an organ for the Vatican. St Peter’s Basilica has a pipe organ that was installed during the 1950s with additional work done to it in the 1960s. This organ has created musical challenges for the Basilica. First, because of the size of St Peter’s, the pipe organ needs to be hugely scaled to create enough sound volume. This results in the organ being too loud towards the front of the Basilica, yet it still cannot be properly heard throughout the sanctuary. Coordination of the pipe organ and choir is also problematic. Finally, as with all pipe organs, the tuning changes along with the temperature in the building. At times, the organ is not in tune with other instruments used during Mass, a problem that does not exist with digital organs. With a flexible audio system, the Vatican’s Allen organ includes its own speaker system, as well as audio outputs enabling the organ sound to be integrated with the Basilica’s PA system. This allows the organ’s sound to be at the appropriate levels throughout the Basilica, and also enables better coordination for telecasts; crucial requirements for an organ to serve the Basilica’s music ministry. The Allen organ in St Peter’s has stood up to these demanding requirements. Those that argue against digital sounds for organs seek to stymie the organ’s development. This is not in keeping with a significant portion of the pipe organ’s heritage. Throughout a substantial part of its history, the pipe organ evolved with advancing technology maintaining its position as the King of Instruments. Initially including the advancement of mechanical and electronic control capabilities, digital tone generation is a natural evolution of this march forward in the twenty-first century. The organ’s heritage emanates from instruments whose sounds are or were produced by pipes. The most renowned instruments have resided in large European churches. Neither these instruments nor their heritage is diminished by today’s digital organs. In fact, these digital organs help maintain pipe organ sound heritage for a broader audience. However, the realities of economics, modern building architecture, and the changing needs of music ministries, mean that pipe organs are only a viable solution for a small percentage of today’s churches. This is borne out in the number of churches worldwide choosing digital organs over pipe organs year on year. Many modern churches are acoustically dry due to the use of sound absorbent materials in sanctuaries. This negatively impacts a pipe organ whose sounds need to acoustically mix in a reverberant environment to achieve wonderful results. The cost of a pipe organ is also typically ten times that of a digital equivalent. For those who want to see the organ flourish in the twenty-first century, a more pragmatic approach is required – one that places musical results over emotional arguments and self-interest. It is time to broach the schism that is now over seven decades old. The entire organ industry should work together to promote the organ and its music. It is also important that we make serving our customers’ needs our primary objective. Enjoyed this article very much,..and Steve is right! I’ll throw my two cents in by saying that not every church has the space or budget for a pipe organ,…that being said,…digital is their only option. Digital technology has come a LONG way in producing pipe organ like tone. Yes,..the Vatican could have chosen a pipe organ,but they didn’t,…they chose Allen,…and for a very good reason. Some say the organ was too small,and they should have gone with a four manual organ. Well,..they didn’t make that decision,…the Sistine Chapel Choir chose the organ. I can see where the pipe organ fans are coming from,though. I used to be a Hammond organ fan,and felt if the sound wasn’t being created by tubes,and tone wheels,it wasn’t a real Hammond. Pipe organ people feel if the sound isn’t made by pipes,it’s not a real organ. Well,..it’s the 21st century,and we need to get away from that thinking,and embrace digital organs. as a “choir organ,” this Allen is absolutely right. The Vatican is not a Concert Venue but a holy place for prayers and offices. This organ must support the choir and a (very) large congregation. Therefore, those criticisms were entirely biased, and besides, as an Vatican authority told me: they have already six pipe organs in the Vatican and there is no room to install a pipe organ. Therefore, those criticisms were entirely biased. Besides, as an Vatican authority told me: they have already six pipe organs in the Vatican and there is no room to install a pipe organ. Obviously you are self serving and backstabbing your pipe organ competition which you would just as soon anialate completely. You are taking the low road all the way. Shame! This comment is an example of the logic deprived emotion that has plagued the organ world for decades. This mentality has damaged the art and made the organ less relevant today than it should be. It is posted unedited. Further comments will not be posted unless any claims or charges made are backed by facts. And it seems that kind of mentality,…or similar mentality,… still exists in the pipe organ world where you STILL have people who think that if the sound is not created by pipes,..it’s NOT an organ. Those attitudes are hurting the organ world,…and as you stated,…damaged the art,and making the organ less relevant than it needs to be. I’d like to add,…if I may do so,…the APOBA will NOT allow digital/electronic organ builders in their organization. They claim that an average digital organ will only last 10 to 20 years,..and that a pipe organ is more affordable than one might think. The question I’d like to ask,…okay,..if pipe organs are far more affordable as they claim,…why don’t more churches have them? BUT,..even a 58 stop/rank organ will cost half a million dollars,..if not more. Even a modest 10 rank organ will be around $200,000.00! Then,..you have the cost of maintaining and tuning that pipe organ,…how much more does that add to the cost? Such costs/expenses are WAY out of the reach for most churches,and digital is their only option! I may have gotten SLIGHTLY off topic for a bit,…but think about what I have said! Let me add by saying that those in the pipe organ world will also say the organ is a WINDED instrument,…and claim anything other than that is nothing more than an “electrophone”,..whatever that is,..which is what some are referring to the Allen organ in the St. Peters’s Basilica to be! As an Episcopalian organist with a traditonal bent, our general practice of worship using genuine, authentic practices throughout the liturgy from real plant materials on the altar to acoustic instruments for music leads to a preference for actual pipe organs. My own parish just built a new church and installed a new to us 1962 refurbished Moller organ. There are a plethora of older organs with many decades of service left in them available at a fraction of the cost of a new one and have pipes that will render their musical leadership following the edict of psalm 150 that every thing that have breath praise the Lord. Real pipes “breathe” as do we and lend their authenticity to the liturgy. However, point taken on intonation and other factors. As music director, my job is to provide musical leadership and while i may prefer Anglican, plainchant and traditional hymnody, I need to keep in mind that all parishioners’ spiritual needs must be met and the Roland electronic piano in the vestry awaits calls to service. A grand piano donated does not fit in the new small church space that could be afforded but does yeoman duty as rehearsal instrument. A digital instrument is capable of providing both kinds of sounds (and beyond) to accommodate the needs of most parishioners and of multiple instruments are not an option, digital provides a viable solution. The grandeur of the pipes can be echoed digitally as well as provide for other options. So depending on use – Vatican needing a reliable, in-tune instrument to balance certain liturgical settings seems eminently appropriate, especially given the extant pipe organs in the space. I use the pipe organ for most things but will bring out the electronic instrument when appropriate. If budget had disallowed a pre-loved pipe organ, a digital instrument would have been the fall back position for our church. I am planning a Hauptwerk organ for my home to practice as soaring ceilings and a nave stretching from here to eternity are sorely lacking but I long to play in great cathedrals and intimate churches from around the world. A similar instrument of a real pipe organ were not available at reasonable cost would be more than acceptable to lead worship. Digital additions such as a few extra stops (32′ contrabombarde anyone?) also make the smaller scale instrument possible for spaces not suitable spatially or financially, yet pack the punch for a wide variety of the organ literature and worship support. I dearly hope genuine pipe organs can live on, with new commissions strengthening the organ builders out there as well as maintaining older instruments. I probably have the joy of playing a living breathing instrument for the rest of my life. I look forward to actualizing the Hauptwerk organ at home and travel world wide with headphones and perhaps a large monitor in front to display images from the church whose organ I am playing to immerse myself in the glory that is the king of instruments but will always know the voice from over the narthex is one that is praising the Lord with all its breath as I do. Thank you for sharing your ideas. While a “virtual organ” is a viable option for a practice instrument if cost is a key factor, this solution has compromises as outline in other parts of this Blog. There are small digital organs that may also consider.